Here is the list of the hotels near Roost-Warendin. Book your hotel near Roost-Warendin today, Thursday 09 May for the best price, reservation and cancellation free of charge thanks to our partner Booking.com, leader in on-line hotels reservation. Below here is the list the 50 closest hotels of Roost-Warendin, sortable according your criteria. You will find the position of these accommodations on the Roost-Warendin hotels map. This Kyriad is located just 4 km south of Douai and a 10-minute drive from the A21 motorway. It offers a 24-hour reception, air-conditioned rooms with free Wi-Fi access and modern design. The rooms at Kyriad Douai also feature a welcome tray , a work desk and a flat-screen TV with satellite channels. They are contemporary in style and the en suite bathroom is complete with a hairdryer. After enjoying the hotel’s breakfast, you may also choose to drive the 2 km to Dechy or the 30 minutes to Arras. Free private parking is provided on site and the A26 is 22 km away. Set in Corbehem, L'effet SPA provides accommodation with private terraces. All rooms feature a flat-screen TV with satellite channels and a private bathroom. The property features a sauna and free WiFi. All guest rooms at the guest house are equipped with a seating area. Guest rooms will provide guests with a microwave. The daily breakfast offers continental and buffet options. Lille is 43 km from L'effet SPA. Lille Airport is 38 km away. This 18th century Manor is set in a beautiful park 6km from Douai, in the Nord region. It offers spacious rooms and suites with elegant antique furnishings. The en suite rooms at Manoir de Fourcy are classic in style with leather arm chairs and warm colours. Modern facilities include a flat-screen TV and free Wi-Fi access. Some of the suites feature a spa bath. Every morning a continental breakfast is served. Meal options are available at the manor upon request and guests have a wide range of cafes and restaurants in nearby Douai. Activities and sights nearby include walking in the Manor’s large park and surrounding woodlands and visits to the Gothic Bell Tower in Douai. Manoir de Fourcy is a 15-minute drive from Arras and 30 minutes by car from Lille. Private parking is available onsite. Located in Corbehem, Manoir Les Cèdres dates back to the 19th-Century and is set in a 2-acre park with a terrace. Lille city centre is just a 35-minute drive away. All rooms feature a view of the garden, a seating area and a private bathroom with a hairdryer. Some rooms also include tea and coffee making facilities or a kitchenette. A breakfast is available each morning at Manoir Les Cèdres. Guests can also enjoy homemade cuisine in the evening, upon request. Additional features include free Wi-Fi access throughout and free private parking on site. Arras is a 25-minute drive away and Douai is only 6 km from the property. Appart Cosy Henin Centre is situated in Hénin-Beaumont. The accommodation is 30 km from Lille. The apartment features a flat-screen TV with satellite channels, a well-equipped kitchen with an oven and a microwave, and 1 bathroom with a shower. Arras is 26 km from Appart Cosy Henin Centre, while Tournai is 45 km from the property. The nearest airport is Lille Airport, 24 km from the accommodation. Guest accommodation Courrières Preferred hotel ! Located in Courrières, L'éclosion du Papillon features barbecue facilities and garden. Each accommodation at the 3-star guest house has garden views and free WiFi. Guests can make use of a terrace. All guest rooms in the guest house are fitted with a coffee machine. Complete with a private bathroom, the units at L'éclosion du Papillon come with a flat-screen TV, and some rooms are equipped with a seating area. All units will provide guests with a wardrobe and a kettle. Lille is 30 km from the accommodation. The nearest airport is Lille Airport, 25 km from L'éclosion du Papillon. Situated in Estrées, Bed&B La Ferme De L'ostrevent offers accommodation with a seating area and a kitchenette. Free WiFi is provided. All units come with an oven, microwave, a coffee machine, a toaster and kettle. Guests at the bed and breakfast can enjoy a continental breakfast. Bed&B La Ferme De L'ostrevent offers a terrace. Guests can also relax in the garden or on the shared lounge area. Lille is 49 km from the accommodation, while Arras is 25 km from the property. Lille Airport is 43 km away. Le chalet de la ferme du tertre is located in Villers-au-Tertre, 4.4 km from Mining History Centre of Lewarde, and barbecue facilities, a garden and a terrace are accessible in-house. This chalet also has free WiFi. The chalet features a flat-screen TV with satellite channels, a well-equipped kitchen with an oven and a microwave, and 1 bathroom with a shower. A continental breakfast is served each morning at the property. Le chalet de la ferme du tertre offers a children's playground. The nearest airport is Lille Airport, 48 km from the accommodation. Offering barbecue facilities and a garden, as well as a terrace, Le Gite De La Ferme Du Tertre is set in Villers-au-Tertre, 4.4 km from Mining History Centre of Lewarde. Guests are welcome to enjoy the free WiFi. The apartment is equipped with a satellite flat-screen TV. The kitchen is fitted with a dishwasher and an oven, as well as coffee machine. A continental breakfast can be enjoyed at the property. The apartment offers a children's playground. A bicycle rental service is available at Le Gite De La Ferme Du Tertre, while cycling and hiking can be enjoyed nearby. The nearest airport is Lille Airport, 48 km from the accommodation. 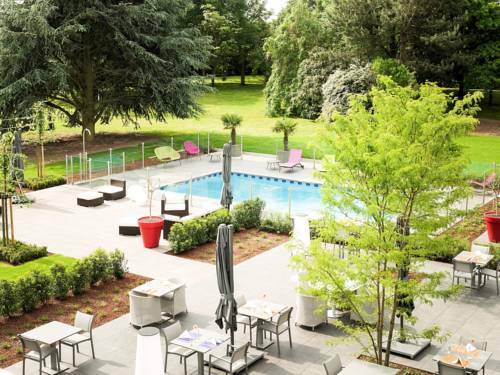 Providing a sauna, fitness centre and rooftop terrace, Le Château is set in Fresnoy-en-Gohelle in the Nord-Pas-de-Calais Region and 12 km from the Louvre-Lens Museum. Free WiFi and free private parking are available. Each room offers views of the surrounding park and is equipped with a flat-screen TV and fireplace. The private bathrooms include a shower, hairdryer, bathrobes and free toiletries. A continental breakfast is served everyday at the property and there is a shared lounge for guests' convenience. Upon prior reservation, guests can enjoy homemade evening meals at the property. The area is popular for hiking and cycling and free bikes can be hired at the castle. Vimy is 8 km away from Le Château and Arras and Arras SNCF Train Station are 15 km from the property. Several World War I battlefields can be found in the area and Lille Airport is 28 km from the property. Set in Annay, L'Auberge du Lac has a garden and terrace. Providing a restaurant, the property also has a bar. Free WiFi is provided. All units in the inn are equipped with a TV. The rooms include a private bathroom, while some feature a lake view. The units have a desk. L'Auberge du Lac offers a continental or buffet breakfast. Cycling is among the activities that guests can enjoy near the accommodation. Lille is 31 km from L'Auberge du Lac, while Arras is 25 km from the property. Lille Airport is 25 km away. Located 28 km from Lille, La Romanée offers pet-friendly accommodation in Sallaumines. The property features views of the garden is 48 km from Ypres. Free private parking is available on site. An oven and a microwave can be found in the kitchen and there is a private bathroom. A flat-screen TV with satellite channels, as well as an iPod docking station are featured. La Romanée features free WiFi throughout the property. Arras is 16 km from La Romanée, while Tournai is 43 km from the property. The nearest airport is Lille Airport, 24 km from La Romanée. Bollaert Football Stadium in Lens and the Louvre Lens Museum are a 10 minute drive from the property. Below here is the hotels map of Roost-Warendin. Names and details of Roost-Warendin hotels can be shown on the map clicking on the prices icons.